That’s right, the 2015 Simming Fall Festival will be held today (5th Dec) from 8:30 AM to 5:30 PM EST (1:30 PM to 10:30 PM GMT) in IRC chat rooms. 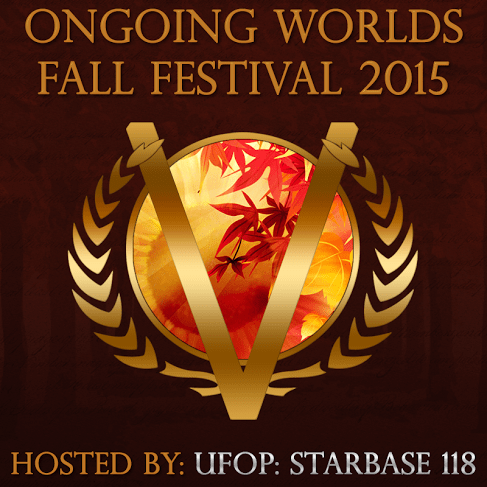 Host UFOP: StarBase 118 and chair James Drysdale have put together an absolutely fantastic schedule that features some of the most talented from among us leading multiple discussions, games, and trivias. No matter who you are in the community–from an Ensign to a Fleet Admiral, a rogue trader to a Jedi, or an Orc to an Elf, there will be something for you! FallFest is when the entire simming and online role playing community comes together to discuss our craft. We talk about how to be better writers. We talk about how to be better leaders. We about how to better get along. And most importantly, we have fun, and lots of it! Those who have attended past FallFests will all agree: It is the highlight of the year. And you can be a part of it! Role Player: You’ll hear from a host of other writers, some with decades of experience and some who are fresh off their first post or chat. Each took a different road to their roleplay or sim, and each has a different story to tell. You’ll definitely learn more about something neat–it could be character development, world building, both, or most likely, much, more more! Host: The engines that make our community go–the hosts! Dozens will be in attendance to talk about how to recruit, how to integrate different types players, and how to develop true team storytellers. And that age-old problem: how to cure collective writing block–how to get a whole group to participate more! It’s all going to be there! Club Leader: No where will you get to discuss the issues of the day with more of your fellow community leaders in one place. You’ll be able to share problems and potential solutions and discuss ways to collaborate together on other big projects. This is the place to rub elbows with the best! All simmers and online role players, regardless of rank or club affiliation, are invited to attend and participate in FallFest. See you there!